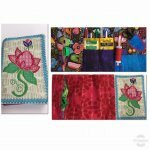 These ruler work classes - Ruler Work Skill Builder Series 1, 2, and 3 - are designed for the quilter who knows the basics of ruler work on a home sewing machine and is ready to explore more challenging designs using ruler work. Each Skill Builder Class is a stand alone class and geared to bolster your ruler work skills, your free motion quilting skills and your design skills. Note: pre-requisite class: Ruler Work for the Newbie. The rulers used in these Skill Builder classes are the ones you purchased for the Ruler Work for the Newbie Class. No additional rulers will be required for any of the 3 Skill Builder classes. Penny Wool Monthly Club - A really addictive hobby! Join Mary as she teaches us needle felting 3 dimensional objects from wool roving, batts, and top coats. This class is for people who have some experience working with wool. Please contact the store if you are a new person wanting to join us.